The Authorization is process that determines what a user is able to do this. For example Admin user is allowed to install / remove software from computer and non-Admin user can able to use the software from computer. It is independent and orthogonal from the Authentication. However, Authorization required an Authentication mechanism. For application first step is always Authentication and then Authorization. Authorization is a process that determines what a user is able to do. For example, an Admin user is allowed to install/remove a software from a computer and a non-Admin user can use the software from the computer. It is independent and orthogonal from authentication. However, authorization requires an authentication mechanism. For applications, the first step is always authentication and then authorization. Using AuthorizeFilter, we can control the access in our MVC / Web API application by specifying this attribute in controller or action method. Similarly, there is a way to control access in our Razor pages, i.e., to use authorization conventions at startup. These conventions allow us to authorize users to access individual pages or folders of the pages. In the same way, these conventions allow anonymous users to access individual pages or folders of pages. To demonstrate the concept, I have created an application with ASP.NET Core Identity. For guidance on how to create an application with ASP.NET Core Identity, please refer to my article "Overview Of Identity In ASP.NET Core 2.0" . Using AddRazorPagesOptions, we can add an AuthorizeFilter to the page at the specified path. With AddRazorPagesOptions, we have a couple of methods that can be used to authorize or allow anonymous access to the page or folder. This adds an AuthorizeFilter to the specified page. There are two extension methods: one is "to accept the page name" and other one is " to accept page name and authorization policy". This adds AuthorizeFilter to all pages under a specified folder. There are two extension methods - accept the folder path, and accept the folder path and authorization policy. This adds AllowAnonymousFilter to the specified page. This adds AllowAnonymousFilter to all the pages under the specified folder. This is the same as AuthorizePage method. It adds AuthorizeFilter to the specified page under the specified Area. It also has an extension method that accepts the authorization policy. This is the same as the AuthorizeFolder method. It adds AuthorizeFilter to the all the pages under the specified folder under the specified Area. It also has extension method that accepts the authorization policy. This adds AllowAnonymousFilter to the specified page that is located under the specified area. This adds AllowAnonymousFilter to all the pages that are located under the specified area folder. 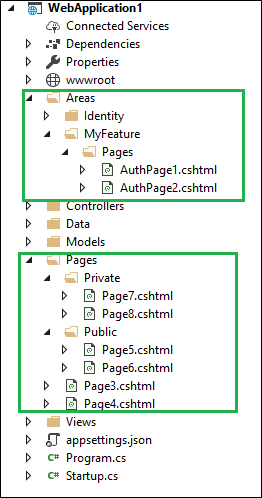 To demonstrate the concept, I have created a few pages and the following snippet shows the folder structure of defined authorization in the project. The authorization conventions can be also applied to Razor class Library. We can also specify authorization for the folder and within this folder it allows anonymous access. The reverse case is not allowed; i.e., we cannot define folder for anonymous access and specify a page within it for authorization. In this case, AllowAnonymousFilter is always applied and AuthorizeFilter is ignored. Using this authorization convention, we can apply authorization on Razor pages. This convention can also be applied to Razor class Library (RCL) project if we use it in our project. In the case of RCL, the conventions are defined in the project that used RCL.